The IMSL_MVAR_NORMALITY function computes Mardia’s multivariate measures of skewness and kurtosis and tests for multivariate normality. Both measures are invariant under the affine (matrix) transformation AX + D, and reduce to univariate measures when p = N_ELEMENTS(X(0,*)) = 1. Using formulas given in Mardia and Foster (1983), the approximate expected value, asymptotic standard error, and asymptotic p-value for b2,p, and the approximate expected value, an asymptotic chi-squared statistic, and p-value for the b1,p statistic are computed. These statistics are all computed under the null hypothesis of a multivariate normal distribution. In addition, standard normal scores W1(b1,p) and W2(b2,p) (different from but similar to the asymptotic normal and chi-squared statistics above) are computed. This chi-squared statistic may be used to test for multivariate normality. A p-value for the chi-squared statistic is also computed. In the following example, 150 observations from a 5 dimensional standard normal distribution are generated via routine IMSL_RANDOM. The skewness and kurtosis statistics are then computed for these observations. N_ELEMENTS(X(0,*)) is the dimensionality of the multivariate space for which the skewness and kurtosis are to be computed (the number of variables in X). If present and nonzero, double precision is used. One-dimensional array containing the frequencies. Frequencies must be integer values. The default value is 1 for all frequencies. Named variable in the form of a one-dimensional array of length N_ELEMENTS(X(0,*)) containing the sample mean. Named variable with the number of rows of data in X that contain missing values (NaN). Named variable with an upper triangular array containing the Cholesky RTR factorization of the covariance matrix. Named variable containing the sum of the frequencies of all observations used in the computations. 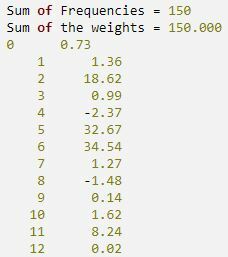 Named variable containing the sum of the weights times the frequencies for all observations used in the computations. One-dimensional array containing the weights. Weights must be non-negative. The default value is 1 for all weights.